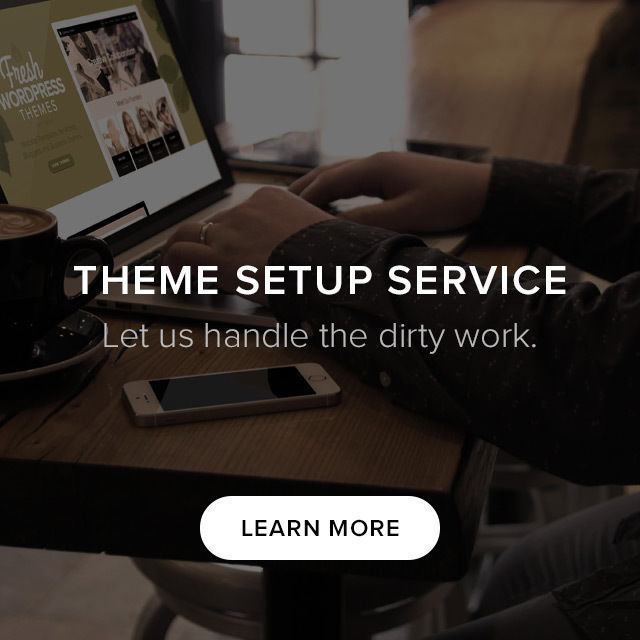 We chose the name “Organic Themes” because we felt it reflected our personal lifestyles, and suited our approach to the design and development of WordPress themes. Organic Themes are professionally designed without excessive flashy effects, gradients, drop shadows and other unnecessary added “hormones” of the design world. In addition, our code is clean, easy to understand, and the theme options are not overwhelming. This allows for faster load times, setup and customization of your theme. We believe that less can be more. Bloated code and frameworks aren’t always the best solution. The WordPress platform is such a powerful content management system by itself, there’s really no need to tamper with it. With an Organic Theme, you receive a beautifully designed, complete theme as it was meant to function on the WordPress platform. Organic Themes offers a variety of premium WordPress themes for artists, businesses and bloggers. Our collection of themes is always growing to suit the needs of our customers. The themes available from our site are designed and developed for the WordPress platform from wordpress.org, which is not to be confused with the blogging community site of wordpress.com. We release new themes on a regular basis and provide continuous updates for our existing themes. With the purchase of an Organic Theme you will receive an awesome WordPress theme, access to our helpful support forums, documentation, design files, demo content and more. David was born and raised in the swamps of Central Florida. He stumbled in to design after graduating from UCF with a degree in Computer Animation. He moved to Hawaii in 2007 and started a freelance design company. In 2009, David and Jeff began creating Organic Themes. David’s expertise lies in graphic design, HTML and CSS development. His passions are surfing, hiking, fishing and anything else involving the ocean. David currently resides with his wife Emily in Lahaina, Maui. Born and raised in Florida, Jeff earned degrees in marketing and IT before settling into web development over 4 years ago. For the past 3 years he has run a successful freelance operation, focused exclusively on WordPress, developing front and back end solutions. Jeff remains a consummate outdoorsman, splitting his time between Hawaii and Florida. Emily is the customer support manager for Organic Themes. She is knowledgeable about WordPress and our themes, and enjoys yoga, cooking, and pottery. Amanda on GDPR Compliance Is Here, Is Your WordPress Website Ready?